Planning meeting for the spring Carport Theater event, which will take place on March 22 and 23, 2019. The theme is "breakthrough," which can include "breakout", or "breakdown". Anyone is welcome who is interested in participating, either as a performer, writer, or stage help, or is simply curious to learn more. Join us for some fun brainstorming! BARBEA WILLIAMS PERFORMING Co. Annual HOLIDAY BAZAAR Extraordinaire Fun, ALL-DAY ACTIVITIES while YOU Shop to U Drop! 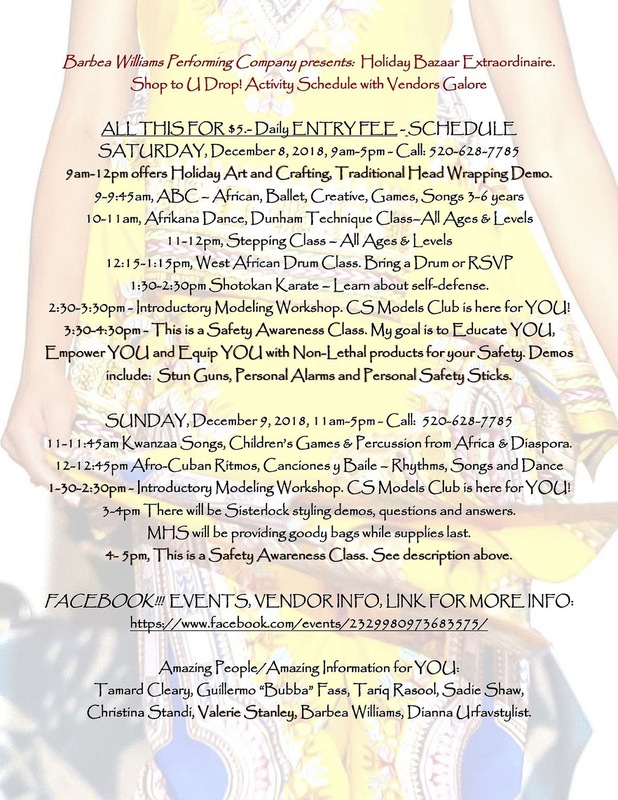 Afrikana/Afro-Cuban Dance and Drum Circles, Modeling Workshop, Henna Designs, Stepping Class, Guest Artists, Massage Therapist, Face Painting, Karate, Shakere'/Percussion Workshops, Safety Awareness Workshop, Games from African and African American Traditions, Traditional Head Wrapping Lecture and Demo, Holiday Crafting and more. See Facebook event page for vendor info & schedule. Shopping with Vendors Galore, including Food Vendors - Soaps, Mixed Media, Jewelry, Clothing, T-Shirts, African Art, Oils, Incense, Candles, Hair Products, Shea Butter Products, Crafts, Books, Adrinkra Clay Designs, Gourd Art, Handmade Dolls, Cloth Napkins and Purses & more. Raffle Prizes. 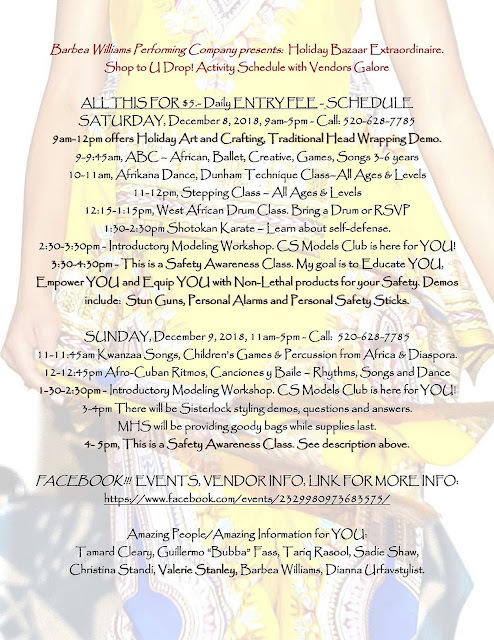 Call: 520-628-7785 - Information & Vendors Application. Saturday, December 8th, 9am-5pm AND Sunday, December 9th, 11am-5pm. Dunbar Pavilion, 325 W. 2nd Street, Tucson, AZ. All for $5,- Entry Fee. It's our latest under-rehearsed and over-dramatic musical comedy revue, holiday edition! We're doing Christmas and Hanukkah songs with our Mayhem twist! FOR THE MOST DIRECT ROUTE TO THE THEATRE, ENTER THE MALL THROUGH OR NEXT TO THE CONTAINER STORE. PLEASE NOTE: This location is located in within the Tucson Mall. The Mall closes at 6pm. If you arrive after 6pm, we anticipate that the only unlocked door will be the mall entrance on the ground floor next to the Container Store, near the Cheesecake Factory. Unused tickets can be traded for tickets to a future show. 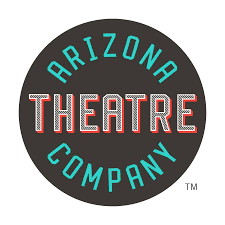 Subject: Arizona Theatre Company: The Music Man! Coming to Tucson from our friends at Arizona Theatre Company! Don't miss, "The Music Man," directed by ATC Artistic Director David Ivers. (Starring Gaslight favorite, Armen Dirtadian!) On stage in Tucson at the Temple of Music & Art, 330 S. Scott Ave., from Dec. 1-30! See more info below including a special offer to Gaslight Theatre audiences! Trouble's comin' … The irresistible musical tribute to the power of make-believe marches onto the ATC stages – and into your heart – with trumpets blaring! Meredith Willson's six-time Tony Award®-winning musical comedy has been entertaining audiences since 1957, regaling them with the story of Harold Hill – the double-shuffle, two-bit, thimble-rigger con artist who rolls into River City station one hot Iowa summer. Hill is intent on swindling the small-town simpletons by turning them against the new pool table at the local billiard hall – a problem that can, of course, only be solved by forming a boys' band with a wagon full of horns supplied by the swindling salesman himself. Along the way, Hill must seduce the only person in River City smart enough to see through his scam – librarian and music teacher Marian Paroo. By turns wicked, funny, warm, romantic, and touching, The Music Man is American musical theatre at its best. Come have the time of your life!!!! Donna and the Dynamos step out of the shadows at Sophie's wedding. That spirit of unquenchable optimism thrives in the eager Arizona Onstage production of “Mamma Mia,” celebrating the songs of ABBA. No matter how many times you've seen it, on Broadway, at Broadway in Tucson or someplace in between, you haven't seen a production more endearing than this one directed by Debbie Runge. Danae Dorame gets the star-making role of Sophie, the Greek island girl who discovers her mom Donna's old diary, only to read how her mom spent the night (dot...dot...dot...) with three different men in the summer of 1979. Convinced one of these men is the father she has never known, 20-year-old Sophie invited all three to her wedding on the tiny island where she grew up, helping her mom run a picturesque taverna. Back when Donna was carefree and single she was the lead singer of Donna and the Dynamos. But once Sophie was born, Donna put those dreams aside to run the taverna and make a loving home for her daughter. Dorame has a terrific voice, soaring freely with the impetuousness of youth. Donna is sung by Tucson favorite Liz Crachiolo. Mature and reasoned, her singing adds a bittersweet quality to the role. Donna is proud of her life of independence and resourcefulness, but also knows she has paid a price by staying on the island and raising Sophie by herself. As for those three men with all the dots in Donna's diary. 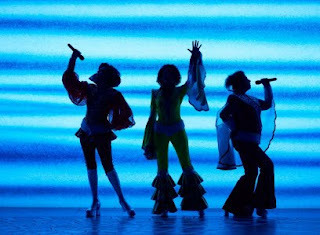 Dennis Tamblyn topped the applause meter as Bill, in his duet and dance number with Jessica Armistead as Rosie, one of the Dynamos. They sing “Take A Chance On Me” the day of Sophie's wedding. Their natural chemistry together immediately won the audience over, cheering spontaneously. Kit Runge is cast as Sam, the sincere one. He and Donna get to sing the big number “SOS.” They are the natural fit in voice and personality. Harry, the third man, is Jordan Siebert. In his youth they called Harry a headbanger, but he grew up to become the strait-laced one with corporate connections and a proper manner. Also creating a unique character was Stephanie Sikes as Tanya the flamboyant Dynamo, oversexed and proud of it. As the comedy relief Tanya brings a flashy dash of cynicism to counter all the joyfulness from everyone else. Debbie Runge is also the choreographer. With a cast that includes 22 chorus members and 22 songs in the show, she has plenty to work with. All the company numbers are impressive, filling the stage with consistently moving bodies who are well-rehearsed. But walking back to the parking lot after the show, Sophie is the one you will be thinking of. She's the one who discovers herself. Join Arizona Opera for family fun in Tucson! This is a great way to explore opera and make family memories that will last a lifetime. This event features a live performance of the classic opera The Magic Flute (adapted for children), story time, and other fun activities! December 8th, 2018 at 9:00PM — Tucson, AZ. Downtown and iconic 4th Avenue come alive every “Second Saturday” in Tucson, AZ. Join us for Second Saturdays with Don’t Blink Burlesque at The Hut on 4th Avenue in Tucson, AZ. Doors are at 8:00pm, show starts at 9:00pm. There is a $10 cover (some bar stools available but mostly standing room only), and $20 for VIP (includes voucher for one drink at the bar and front section, guaranteed seats). · Tickets available are limited and offered on a first-come, first-served basis. · A limited number of tickets may be offered for purchase at the door. · Event check-in starts at 6 p.m. Stories begin promptly at 6:30 p.m.
· Seating at the event is offered on a first-come, first-served basis. Join faculty from the School of Theatre, Film & Television as they screen their favorite movies about film and television. At each screening, a faculty member will introduce their film of choice and share insight about the film’s history and significance to the entertainment industry. Select screenings will be enhanced with the presentation of a short film by a BFA film student in the program. Winding Road Theater Ensemble, in partnership with the YWCA of Southern Arizona, is proud to present Spring Awakening: In Concert, a special benefit production in support of Planned Parenthood Arizona. Spring Awakening, the groundbreaking musical from Duncan Sheik and Steven Slater, follows the lives of several 19th century German teenagers as they explore their sexuality, attempt to manage their anxieties, and begin to rebel against insurmountable authority. This production features direction by Winding Road Artistic Director Maria Caprile and music direction from local folk/pop/punk favorite Logan Greene. Spring Awakening: In Concert features a talented cast of young local performers, including Sean Cronin, Brin Wassenberg, Tyler Gastelum, Melanie Kersey, Stefanee Chevalier, Jeffrey Baden, Aleesia Hernandez, Jacob Brown, Sarah Loy, Ezra Zurita, Gabriella de Brequet, and Cole Potwardowski. he longs for lies at his feet – in his pile of laundry. PLAY NUMBER THREE IN OUR '18-19 SEASON FOR SCAMPS. Thursday, December 6 @ 7:30 p.m.
Friday, December 7 @ 7:30 p.m.
Saturday, December 8 @ 2:00 p.m.
Sunday, December 9 @ 4:00 p.m.
Thursday, January 10 @ 7:30 p.m.
Friday, January 11@ 7:30 p.m.
Sunday, January 13 @ 2:00 p.m.
UA College of Humanities presents BENNUVAL!, an "out-of-this-world family-friendly variety show." A true variety show, BENNUVAL! will feature Emmy Award-winning host Geoff Notkin, improv comedy from Unscrewed Theater, readings of space poetry the UA Poetry Center, music from ChamberLab composer Chris Black, and performances by the renowned acrobatic ensemble Cirque Roots. BENNUVAL! will feature a “TED-style talk” from Lauretta about the origin of life and the importance of asteroids, including details about both the OSIRIS-REx mission and JAXA’s similar Hayabusa2 probe. The UA College of Humanities named Lauretta its Alumnus of the Year in 2017. Lauretta, who studied Japanese as one of his triple majors at the UA, says his humanities background has been valuable in working with colleagues in the Japan Aerospace Exploration Agency, JAXA. Prepare your 30 Second Personal Logline! Members, come a few minutes early to cast your votes. Learn more about independent film in Arizona and be involved! We offer educational monthly meetings with experts in the film industry - and it's a great opportunity to network with industry professionals. Movie Premiere at Unscrewed Theater TONIGHT! Live Theatre Workshop presents SNOOPY!!! Tucson Improv Movement: Festival Friday is Here! Musical Mayhem Cabaret Presents: "As Seen On TV"
CHRISTIAN FAITH POWERS "BUSY WORLD IS HUSHED"